Ever Gold [Projects] presents a section of the exhibition GENERA#ION: Contemporary Art from Saudi Arabia opening at Minnesota Street Project. As the world’s media reports a resurgent tide of religious intolerance and conflict, a tight-knit group of Saudi artists, both men and women, have acted upon a dream to discover the people and the diversity of America—from the East to West coast— trekking across the US interstate highway system and major cities on a mission to share not only their innate passion to create but also to learn from the local public’s reactions to their artworks. The exhibition will be presented across multiple gallery spaces within Minnesota Street Project including a curated section in Ever Gold Projects. The presentation at Ever Gold will include artists Abdulnsser Gharem and Rashad Shashai. Gharem will be presenting his seminal work The Path (AlSiraat), 2007 comprised of both film and photograph. The work refers to the tragic story of a collapsed bridge in the outskirts of Khamis Mushait where many people had sought protection from a storm. People gathered on the bridge believing it to be the safest place above flood levels, but it was destroyed with the flood killing all those seeking refuge. Newspapers did not report on this tragedy, ultimately excluding it from any records of documentation, and the story was eventually erased over the next generation. 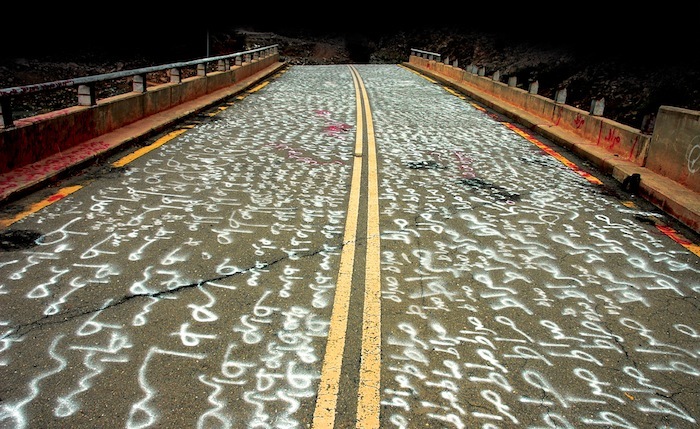 Abdulnasser returned to the bridge years later and as a performative gesture he painted the word siraat (‘the path’) on the bridge. Spending over four days covering the entire structure, Abdulnasser transformed the function of the bridge into a space of active participation. Creating a memorial site for an unrecorded story, he urged the global community to consider alternative approaches to recording histories. It seems fitting that San Francisco, a city that has always welcomed marginalized groups and outsider voices, should welcome these outsider artists from Saudi Arabia. Considered very much the pioneers of their generation, the participating artists are willing to address cultural norms and taboos and their societal impact. In traveling to the U.S. at this time, they are defying mainstream expectations, reaching out directly to bridge the divide across the most contested political and ideological border of our time. This exhibition represents a unique opportunity for the people of San Francisco to enter into a meaningful dialogue with these artists at this crucial time. We aim to make a positive and tangible impact on the cultural scene by focusing on building local talents in the knowledge and creative industries. Blending iconic architectural design with advanced technology, and unique learning methods with enriching programs, ithra is an infinitely inspiring platform for explorers, learners, creators, and leaders – a thriving hub of knowledge, creativity and cross-cultural engagement. As the Kingdom of Saudi Arabia strives to achieve its ambitious national development goals to transition to a knowledge-based economy, ithra acts as a bridge connecting cultures and cultivating a creative and innovative community. At ithra, we believe in the power of people and ideas to unlock new possibilities: the future is what we make of it.